I thought maybe a good starting point would be the idea of care and caring. 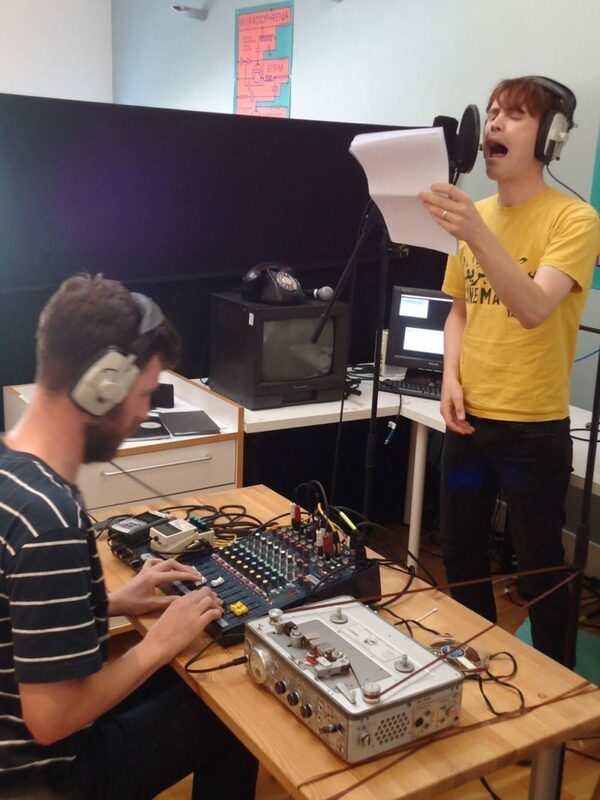 You’ll present some pieces at BRAUBLFF, one of which – I’ve had it up to hear with fish and chips – is based on a set of recordings made with care workers. The piece strikes as very well informed, based on extensive information gathering and listening, though the process of manipulating and reinterpreting the text gives the responses something very material, almost poppy. Who are the workers? How are listening and care related? Both pieces are very much about a process of listening and gathering, interpreting and manipulating. I’ve had it up to hear with fish & chips began as a series of interviews with care workers of all kinds (care workers; social workers; and a mental health nurse) and the title is a quote from one of the interviews (and it was originally spelt ‘here’, but I misspelled it at some point and the resonance stuck). The script is a collage of these interviews, which was then sent to various friends to recite and record as they pleased. Tom then used this as the raw material for the piece. I was really surprised by some of the readings, and I like your mention of pop; I hear a smidge of pop in some of the recordings too, which wouldn’t have come about if we’d given the singers instructions: what Susan Fitzpatrick and Dulcie Mae Goldsbury Murray did with their readings just wouldn’t have occurred to me. And I think that this, in turn, influenced the way that I sang-spoke my part, it gives the music an odd texture. The material quality of the voices is really important, and this is brought out more by Tom’s manipulations. Emphasizing the material-ness of the voice is really central to fish & chips... that emphasizing of the non-verbal, affective qualities of the voice. Listening is related to empathy and is a skill needed in care work and in communicative acts more generally. It can be an activity that opens you up to the world, putting you in touch with other bodies, other materialities in a way that requires you to negotiate, I think listening brings a certain vulnerability, and this is so important when confronting the asymmetrical relations of care. Reading the script for the first time I was struck by the lyrical quality of the sewn together interview extracts and perhaps that’s why some of the readers decided to interpret it in this way, which of course makes it easier to create those more pop elements. For example in the second part the sung line 'te-le-phone' – I was interested in stretching this minute fragment into something almost choral, breaking out of the layers of multiple voices, material which is less discernible. As I rarely use my own voice as a first person instrument, I have to find other ways to articulate a visceral or emotional resonance. Even with our best intentions listening can become a foggy, rarely tangible act, so the in-and-out-of-focus between Ben’s live reading and the manipulated voices constantly fluctuates; something we were keen to represent conceptually. One of the most persistent themes that emerges from all these little text fragments is the difficulty for the care professionals to clearly differentiate between work and non-work situations; empathy is not just a human emotion but becomes a tool of the trade that needs to be called upon in very specific situations. You work as a carer yourself – have you noticed a change in the way you care, since you started working? Is empathy something that you can train? In caring professions empathy is one of the tools of the trade; it’s something you learn and I think this is one of the things the voices in fish & chips are getting at... the attempt to mark out caring as work and non-work is an attempt to grapple with how caring becomes a form of labour, and in this, how it fixes certain responses, certain legitimate ways of performing a caring role, which may be at odds with your own personal approach. I’ll take an example from my most recent work with asylum seekers in Manchester. I volunteer at two different organisations, one of them runs a project giving asylum seekers advice and practical assistance with applying for housing and financial support. In doing this, you have to apply to the Home Office – the government department that deals with asylum claims, which is largely incompetent and discriminatory (I guess that you’ve seen the news about them detaining and deporting EU citizens?) – but as an advice worker you find yourself operating within the parameters set by the Home Office. There’s a particular ritual of telling and listening; you start filling out the application form, and you realize quite quickly that the person on the form becomes this victim figure, which fits a charity narrative. The repetition of this can affect how you respond to people’s stories – you’re empathising with them, but fixing them in some ways as a passive victim of their circumstances. So there’s this dissonance in the interaction as you’re at odds with yourself in this role, and you try and create tactics for doing things otherwise...this is what Difficult to Listen is trying to get at I think. To what extent are these pieces correlated with documentary? Is that something you are interested in? Do you collect all the interview material before you start editing and reinterpreting, or is it a more or less simultaneous process? I’m glad you asked this! I’ve only recently started thinking about fish & chips and Difficult to Listen as documentary. I would say that they’re documentaries; maybe the relation is strongest in DTL because I really felt a responsibility to the organisations I work with, and the community of people who I’ve met there in putting together the hörspiel. This feeling was more intense with DTL because we were not just working with professional carers – who have a bit more autonomy in their roles and lives – but with asylum seekers who are granted very little autonomy in the asylum system (asylum seekers cannot decide where to live, neither can they work or study). Also, as a volunteer and a researcher I’m emotionally invested in both organisations. so there’s this ethical implication... we’re channelling, or trying to speak at the side of and present these transnational, multi-lingual narratives and I would say that DTL is a documentary of the listening cultures of both organisations, and a very personal reflection on my position within these organisations. I like the idea that these pieces can be perceived as documentary, because beneath the abstraction and treatments of material there is a humanness to the places and experiences presented. DTL more so on my part as I volunteered in one of the organisations for a day so I was able meet the people working and visiting the drop-in centre which is a completely different experience to listening back to snapshots of recordings Ben has made. Having said that, I see the importance of both methods more attracted to cinematic/audio fiction where these are not so apparent. Other than Fish and Chips, you recently made a piece Difficult to Listen for the Radiophrenia festival. It’s a festival I’m quite curious about – a real radio tower, analogue radio waves, no audio archive of the event. How did that go? And more generally, what appeals to you in radio as a medium? 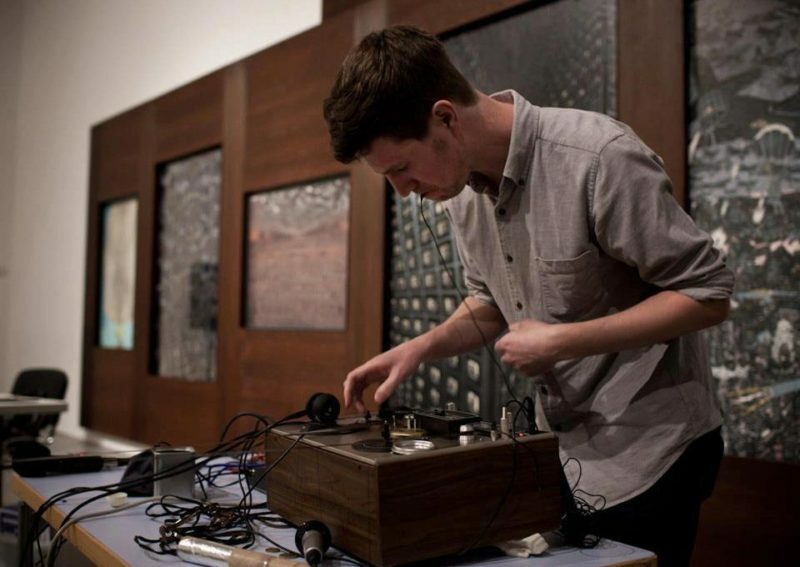 I guess more recently I've become aware and subsequently interested in radiophonic art as a medium to work in different contexts to live, recorded or installation presentations. In particular Radiophrenias broad programming and experimental approach has been an exciting discovery and was keen to explore the medium further upon commission for 2017s festival. For Difficult to listen we were keen to put together a very visual performance, involving stage props – large office dividers that were a lot more difficult to source (a sorry and a thanks to Barry and Mark for finding those), spider plants replicating certain details within the environment of the organisation. This coupled with Ben walking throughout the audience reading the script and the foley materials triggered from a hydrophone in a boiling kettle, sweeping and mic-ing up the desk fan. The live audience can see and hear these things happening in the performance along with a live composition I was mixing/triggering – in contrast to those listening live on air. We were interested in the blurring of those perceptions – how much of this is happening live as foley, a composition, or field recording from RH. The medium of radio allows that. Especially given as you say the lack of archival catch-up, you're forced into an attentiveness and immediacy of listening in the moment. Broadcasting through an antenna locally within Glasgow also encourages unexpected, accidental listening – I can imagine someone tuning in in their car, flicking through the dial and hearing our piece by mistake. How do you work together? Is there a set protocol, or does it change? Do you work together in the same room mostly, or is it an exchange that can happen in other ways? For the most part it’s a 21st Century postal collaboration! But everything coalesces when we rehearse together. Tom lives in London and I’m in Manchester, so we’ll only get together a few times prior to each concert or recording. On both fish & chips and DTL I’ve cobbled together the scripts and Tom has worked on the sound, but I don’t regard it as regimented as that...I mean, I share drafts of the writing with Tom and I’m interested in what he has to say...we don’t work on our own contributions and then glue the final parts together at the end; we’ve always shared initial ideas, sketches and the like, and I think you have to have trust in the working relationship to do that. Prior to Fish and chips we’d not collaborated as a duo before. Ben had written an initial draft and asked if I’d be interested in interpreting that without suggesting any particular approach. We’d exchanged a few ideas but it wasn’t until we were in the same room with the script and recordings of readings that the processes started to generate, stumbling across happy accidents in very much a live set-up. As Ben says it’s a shared process and with DTL that took place over 6 months or so leading up to the Radiophrenia commission. I’d send back responses to his field recordings, mostly makeshift foley edits that would later form chapters once we were in the same room again. You call Difficult to Listen ‘social science fiction’. Please elaborate... Among a lot of artists I know, science fiction is sort of enjoying renewed interest, in Brussels at least. What makes the piece science fiction for you? What permissions or tools are involved? It’s definitely not just a flippant play on words! When I emailed a description of DTL to the staff of one of the organisations they were a bit put out by the idea of Social Science-Fiction...clumsily, I had put the hyphen in the wrong place, so when I asked the manager what they thought they were pretty perplexed that I wanted to describe them all as aliens. It should be Social-Science Fiction, and the flippancy is serious. It’s intended to fold the ethnographic into the fictional; the stitching together of the everyday, transnational narratives of the drop-in in a way that leaves room for that which can’t quite be grasped in the present. For me, Social-Science Fiction is affirmative in the way that it is about the possibilities of the future. Even though the mammoth hunters occupy the cave walls, what people really did to stay alive was gather roots; seeds; berries and maybe a few tusk-less small-fry to up the protein. So the Carrier Bag Theory is about gathering and collecting, and the strange, awkward, surprising, even antagonistic encounters that occur when you do so are what Le Guin wants to write. As for permissions, I think reading this essay opened that portal for me, bringing together the supposedly different worlds of the work I do with asylum seekers, my PhD and more creative approaches, like our hörspiel. It’s also legitimised my own use of narrative, and fiction in my PhD writing... oh, and I think Ursula Le Guin’s Dad was an anthropologist as well, so there you go. The category of listening that is described in the piece is very virtuosic – at one point it feels like a catalogue of strategies for the listener to sidestep the purely empathetic position, but without “being drawn into the way the state listens” There’s something really fascinating about training to listen in very specific ways – especially when the outcome has nothing to do with art or music. What do you think about listening as a political practice? How do you think your practice as artists/musicians has affected the way you listen in other contexts? You’re right, the different modes of listening are virtuosic; in the drop-in people listen legally; socially; deeply; and empathetically. People listen in lots of different ways. And from the perspective of, say, people who have worked, or volunteered for a long time with a particular organisation they have developed their listening skills over years and years. Still, there’s something intangible about listening, which makes it a tricky thing to pin down...this is why there’s probably more emphasis on the voice and letting people speak for themselves. As for a politics of listening; it includes notions such as advocacy, or giving people a voice, but it expands beyond this in different ways as well...I think this has been touched upon in some of the previous questions about the structures which educate our senses, and how you respond in certain situations. In DTL this is touched upon with how the Home Office can fix interactions, how you can end up, even unconsciously listening and speaking like the Home Office. It’s also in the affective nature of the work and the acoustic politics of space that cannot be reduced to the voice...I think the expanded listening practices you discover as a musician (or non-musician in my case) have been a big influence for me. I’m a great believer in bringing together the different parts of what you do, so they can contaminate each other, and you end up finding these surprising resonances. So a practice like Pauline Oliveros’ Deep Listening can be an influence on how you listen to the ambient sounds and acoustic qualities of the drop-in. And for example, you learn to appreciate the human or non-human sounds that might not be paid attention to otherwise. I recently presented my work to students and after a short performance we got on to the subject of noise pollution, in particular domestic situations in which we experience an aggravated leakage of sound due to close proximity living and poorly built housing. Living in London this is somewhat unavoidable and certainly the acts of concentrated listening as an artist working with sound has affected this to detrimental levels. You become more attuned to the ambient sounds around you. Perhaps the inevitable frustration arises from the lack of control, or the willingness to avoid confrontation. This week I read a report in which a certain percentage of Londoners have noticed a low frequency hum that cannot be attributed to anything concrete; an ambiguous, bewildering drone coming from nowhere in particular. Described by one sufferer as being like the lowest string of a bass guitar and through constantly tuning into it she feels compelled to leave. On the plus side however, becoming more aware of your surroundings can be a rewarding, positive experience – noticing details In the everyday that others may not – the unheard and unseen. From experience it’s even more rewarding when this becomes a shared collective endeavour. I’d say DTL is more of a poetic reflection of listening within those spaces, in terms of the sounds recorded as foley/concrete elements. The treatment of which has of course been exaggerated to an extreme that they begin to lose their original sources and meaning.